Unexpectedly, a knock on the door interrupted his evening reflections. He opened the door and saw an old peasant woman with an apologetic smile who was shaking off the snow from her shawl. She informed the priest that a child was born that morning from her poor neighbor and the parents of the baby asked to bring a priest to bless the child. It was an important practice in his small parish to bless a child immediately after birth, but the priest realized he had not much time before the midnight mass. Not wanting to upset the old lady and the parents of the child, the kind priest agreed to come. He followed her out into the night, through the snowy evening and up the rocky slopes. They reached their destination, a little mountain hut. They went in and immediately they were welcomed by the warmth and happiness inside: The mother lay on a makeshift bed, smiling at the little baby in her arms. At the side of the mother was the proud father, signaling a welcome to the newly arrived guests. The priest gave them his blessings and stayed with them for a while. Then, he hurriedly set off down the mountain to prepare for the midnight mass. The old hut on the mountain brought his thoughts back to the manger where Jesus was born. It was as if he had seen the Christmas miracle. With that encounter with the poor family, on that very night and in that little far-off hamlet, he witnessed a heavenly meaning of Christmas. It was a silent night, a holy night, just as it had been when Jesus was born. The well-loved village priest was Fr Joseph Mohr. He was born in the city of Salzburg on December 11, 1792. Fr Mohr was a man of humble origins. He knew poverty, for he lived in utter poverty in his early years. His father, who was a soldier, abandoned them when it was discovered that his mother was pregnant. His mother, single-handedly worked hard for her children. She earned a meager income from her spinning and knitting. Mohr grew up not having enough food to eat and not having a father’s love to cherish. He was the third child that his mother had, out-of-wedlock. The little Franz would always find himself unhappy, but always turning to his mother to ease his heart. Fortunately, he found a father figure in church choirmaster Johann Hiernle. This choirmaster recognized Joseph’s’ musical talent and helped him receive a proper education. After having some background in music and learning guitar, violin, and organ, he discovered a vocation for the priesthood. He entered the seminary and was ordained a priest in 1815. Mariapfarr was his first assignment as a priest. From Mariapfarr he was transferred to the village of Oberndorf. There, he befriended the church organist Franz Xaver Gruber, who was a schoolteacher in neighboring Arnsdorf. Franz Xaver Gruber was born on 1787 in the village of Unterweizberg in Bavaria. He also came from a poor family. As a boy, Franz showed an inclination and talent for music. His father, however resisted his son’s desire to learn music. Being a weaver, he wanted his son to learn other skills that would bring income to their poor family. Unknown to his father, Franz took violin lessons and learned to play the organ at his church. His father heard Franz’s organ playing one day and recognizing his musical skills, he relented. He allowed his son to study to be a teacher. In 1807 he became a schoolteacher and he continued to develop his musical skills. In 1816 he became the organist at St Nicholas Church. It was on December 24th in 1818 that Father Joseph Mohr walked over to Franz Gruber’s home. He asked the organist to take a Christmas poem the priest had written two years earlier in Mariapfarr and set it to music. Gruber was so touched by the words of the poem, that he applied a slow and gentle melody unto the words That very day the song was completed. In that evening of 1818, during the midnight Mass at St Nicholas Church in Oberndorf “Silent Night” was sung for the first time in the church. 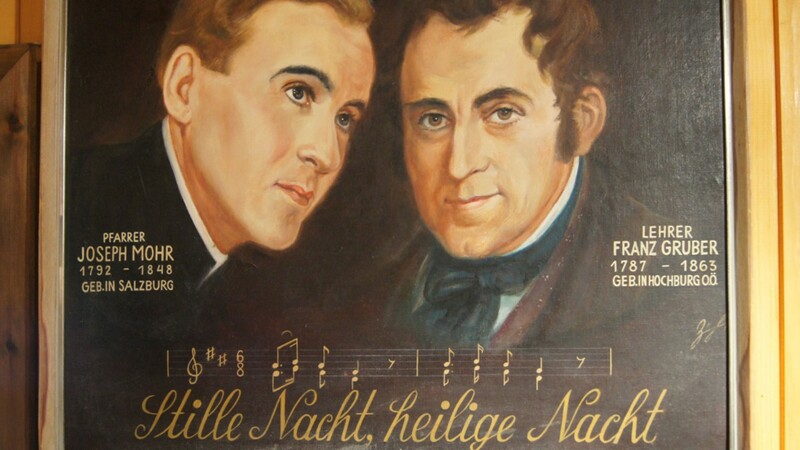 The voices of Fr Mohr and Gruber – the lyricist and the man who composed the music – blended in perfect harmony. Fr Mohr played the guitar. The church goers were in awe with the resonating lyrics and melody of the song. Its gentle words and nostalgic tune was powerful enough to melt one’s heart. That simple song has journeyed slowly to almost all parts of the words. Today we can hear it in French, German, Italian, English, Spanish – in almost every language. Its Filipino version is defined with a tender distinction, with more enchanting lyrics. Undoubtedly, Silent Night is one the best and well-loved Christmas carols in the world. But, why has it acquired such popular eminence? For some, it is far from the charm of Joy to the World of Handel. Others claim that It is distinct from the theologically rich lyrics of Hark the Herald Angels Sing of Charles Wesley. Silent Night is so simple. It could have been the lyrics of Silent Night —so tender, familiar and gentle from the very heart of Fr Mohr, who had witnessed with his heart the poverty of the manger of Jesus. It could have been its music — so peaceful, so haunting and so easy to recall. Compellingly, Silent Night is beloved because it reminds us in its simple, but exceedingly clear way, the real message of Christmas: “Christ, the Savior is born!” … the real meaning of Christmas that we should always focus on at this time of every year.